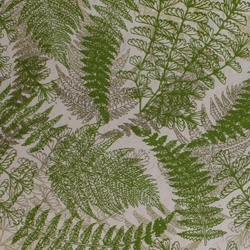 Bold colors and designs jump off the page with screenprinted Lokta paper featuring metallic gold and olive green fern leaves on natural paper. Nepalese paper artisans hand-craft Lokta paper out of fibers from the bark of the Lokta bush and then silkscreen eye-catching designs onto the sheet. This neutral lokta paper starts with a cream colored based paper and overlays metallic gold and olive green fern leaves on top.